Just put my stock/summer wheels and tires back on Max Friday afternoon. Gotta say I think I may look on Craigslist for another set of 16" wheels and try to sell the stock 17"ers. My winter tire widths are 205's and stock is 225's. Initial impressions just changing the wheels and carrying them to their resting place: 17's are WAY heavier than the 16's. Though on the plus side they still don't come close to the stupid 18's with Run Flats on our Sienna. Driving with them, I think part of my initial dislike of some twitchiness in the handling of the C-Max may be attributed to the stock tires. Once they were back on I noticed it kinda feeling like it was yanking back and forth a touch on some of my country roads. It also just seems like on occasion the stock tires feel like they have more resistance. Who knows. Lighter is always better, but from what other people here said on the forum, one guy Pjones I believe, the stock wheels got the best MPG numbers. I have not tested any other wheels so I don't know. Can you weigh one of your 16 inch wheels and post it here? Put it on a bathroom scale and check it, also try to stand on the scale without it and then with carrying it and check it to make sure both measurements match (wheel by itself and then wheel with you minus your weight). Next time I rotate my tires at 50k miles I'll weigh mine (stock tires). How was your speed with the optional wheels? I mean the speedometer, was it accurate? With the stock wheels its like 1 to 2 miles per hour off, indicates higher than real in other words 66mph might be 64-65, 38mph might be 37. Edited by rbort, 18 April 2016 - 07:33 AM. Can you weigh one of your wheels and post it here? Put it on a bathroom scale and check it, also try to stand on the scale without it and then with carrying it and check it to make sure both measurements match. Next time I rotate my tires at 50k miles I'll weigh mine. Well I think the tires might make more difference in the mileage than the wheels. The compound, tread and width. Let alone that if you manage not getting the same size overall diameter mpg isn't going to display correctly. My winter tires are approximately 1% smaller so they should read just a hair higher than usual. Same with weight as far as that goes, the tires could weigh more or less depending on model. Let alone as to how LRR they are. I think the weight comes into play with the more adjustment of speed you're doing. At a constant speed the weight probably doesn't matter as much. I'd guess there could be some slight difference in mpg from the actual design of the wheels(I've only assumed that's the reasoning behind the weird plastic rings that make the nice alloy wheels on the prius look considerably more ugly). But I don't get the impression the stock C-Max wheels look like anything designed to be more aerodynamic. The wheels are 22.5lbs. IIRC looking at Tire Rack when shopping for winter wheels I saw a range from like 16-20lbs each. But those were 16's I think. I haven't looked to see the difference in tire weights, but I think Tire Rack likely has those listed as well. Levi, would like your opinion on tire choice since you were running smaller tires. My stock Michelin's with 48k miles are now getting scary in the rain, never really liked their performance except for the gas mileage (I keep them at 48psi and they roll on forever). Long story short, this past winter I hit a rock on the shoulder avoiding a wrecked minivan that I may not have if the tires hadn't given up all traction in the 1/4" of snow we had. I am thinking of switching to the Continental PureContact w/EcoPlus as they seem to have better performance in all categories other than mileage efficiency. There are a couple of issues that have me from jumping on them though; they weigh 2lbs more per tire and the tread width is .5" more (8.7"). The upsides, other than performance, are the 700 UTQG tread wear compared to the the 480 of the Michelin's and cost $138 vs $186. Now to my issue, I see I can get this same tire in the 205/60-16 size for $94. Knowing that my speedo and trip meter will be slightly off (but actually less so than my fairly worn Michelin's) there are quite a few benefits; the weight drops to 21 lbs (1 lb less than stock) and tread width is 7.3" vs 8.2" stock Michelin's. Now I'll have to get some new rims (try to find something with less weight than the stock rims) but since these tires are half the cost of the Michelin's, weigh less, and have less tread width for when it is snowy (I live in CT), they seem like a good thing. The downsides are the these are rated 92H instead of 93V, so a little hit on the load capacity (which doesn't really mean a lot to me as you really can't fit much in this car and H rating is good to 130 MPH which I don't think this car can get to) and the fact they have less tread width for when it's not snowy. I agree, the only real downside to the smaller tires is potentially the weight limit, but as I recall on my winter tires, the capacity difference wasn't much difference... Maybe around 100lbs? Unless you get a winter tire that's able to be used all season, I'm not sure there's any that I'd really like in the snow... My experience is that if you don't have to deal with hills and your roads are generally clear then you'll just be slippery but probably make it on all seasons. But on my hill, I just can't make it up on them on a few bad days a year. As far as going narrower/taller(stepping down to 16" wheels)... My gut feeling is that there might be a bit of a loss of absolute handling on dry pavement but personally I don't generally get the car up to the point where the tires are squealing and they are starting to lose grip around corners. If you do, I'd stay with the full width. I'll also say that my personal opinion was that I think I actually liked the handling with the winter tires better even on dry stuff. But that's more of a factor of how the car felt than whether it could pull 1G around a corner. I'm not entirely sure which would wear faster... I can see reasoning for either narrower or wider and the extra tire height/composition having an impact as well. I haven't gotten searched too far into it since my summer tires are still holding quite a bit of tread. If weight capacity and the wheels seem fine with 205's then I'd quite likely lean to 205/17's as well. Check some local junkyards. 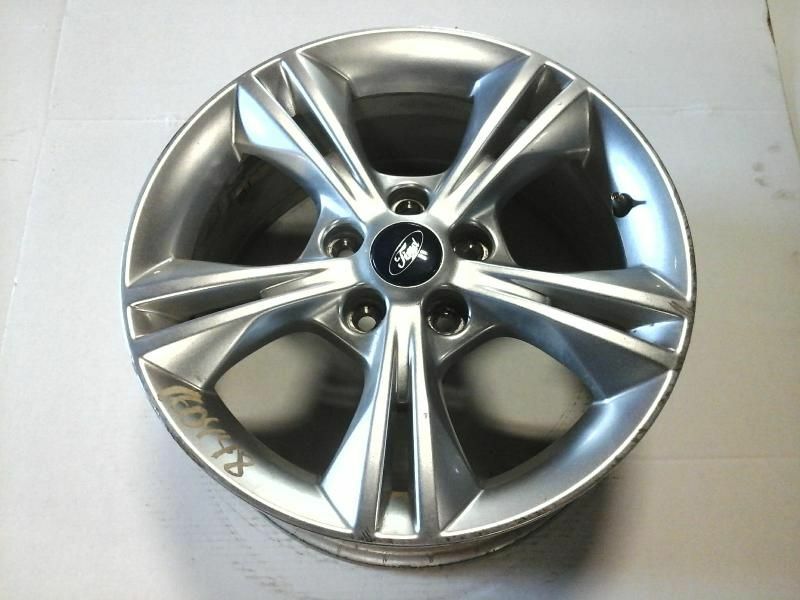 I just picked up a set of these 16" Focus Wheels that will fit the C-Max for $50 a wheel. I'll use them with my Bridgestone Blizzaks. Edited by RubyMax, 08 August 2016 - 11:11 AM. Yeah, IIRC I think I picked up my set of 16" alloy Taurus wheels with almost new tires for maybe $300. There are some good deals out there, I just haven't looked much lately for them. Our Sienna is the vehicle that needs tires more immediately and those are just stupid expensive. Would really rather trade the 18" wheels for 17's. Did some more digging and think I'll go with the Continintal PureContact w/Eco in size 215/50R17, put them on my existing wheels, keep the TPMS sensors. I believe these will be a good compromise. Same weight as stock Michelins, close diameter (these are 1.5% smaller), slightly smaller tread width (8" vs 8.2"), higher load capacity and keeps the V speed rating though I'll never need it. I'm sure ECO mileage will suffer a little but they retain the 51psi max inflation pressure so can still pump them up. Wear rating is higher but I never put much faith in it, slight misalignment and its gone anyway. Much higher rated tire for rain/snow/noise. Will feel much safer when caught at work and have to drive though the initial stages of snow storms to get home. Hell, will fell much safer just driving in the rain again. Would have liked to have some lighter wheels but just can't justify the additional cost, especially if I want to get them from TireRack all mounted and balanced (need to add new TPMS sensors at $42ea and then reprogramming). Could have done the 16" tires with wheels all said and done for just over $900 but now can get this done locally for just under $600 and don't have to deal with selling or storing the old wheels. But then you've got the usual losses of gaining all that extra rubber on new tires so who knows.